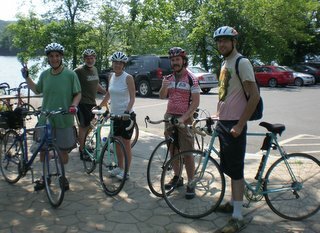 Eight riders poured into the Albany Daily Grind Café around 10am and then we were off down Washington, State, and Pine to the pedestrian bridge. Regrettably, Toni suffered a bent rim and, despite Chris’s expert technical prowess, she and Ken had to abandon the ride. The remaining six zipped north on the newly-repaved and widened (thanks Albany!) Mohawk-Hudson Bike-Hike Trail to Watervliet for a photo op. Along the way, we all noted Chris’s 360-degree power strokes using his new clip-less pedals and, of course, drooled over May Lou’s sparkling new Serotta (made by her son, Patrick). After crossing the Green Island Bridge, we ran into Troy’s “Pig Out” and the world-renowned Troy Famers’ Market – temporarily arrayed along River St. Louis and Jesse left the ride to join up with friends at the Pig Out (whatever that is) and the remaining four enjoyed a welcome break at the Daily Grind. After a stop at the Farmers’ Market for a container of milk (?) and a chat with the Troy Bike Rescue folk, we headed back to Albany wrapping up with a “invigorating” climb up the bike lanes on Clinton Ave. Kudos – We are grateful to Lee and Rick of the Daily Grind Café for sponsoring our ride with a complementary beverage at both shops and to the gracious hostesses at our lunch stop in Troy. We also noted that the Daily Grind Café arranged with the City for installation of the only one of two bicycle racks on Lark St – years before the city wide installations began last month.